The entrance to the Gold King Mine near Silverton, Colo. (EPA photo). Mention the practice of re-mining to anyone familiar with Colorado mining history, and the specter of a 1990’s disaster dwarfing last summer’s Gold King Mine spill into the Animas River is likely to loom large: Summitville. Taxpayers have doled out more than $150 million to try to clean up the mess left by a Canadian company that declared bankruptcy in 1992 after it dug up old mine works in the San Juan Mountains near Del Norte and piled them into a cyanide heap leach to extract gold, silver and copper. But once the company pulled the plug, acid mine drainage made its way downstream, where it killed off a 17-mile stretch of the Alamosa River, and Colorado and federal regulators had to scramble (pdf) to keep the situation from becoming even worse. Re-mining, or going back in to recover minerals from old, abandoned mines, is now being mentioned as a possible means of getting modern mining companies to help clean up the toxic drainage from thousands of old, abandoned hardrock mines contaminating streams across the West – like the Gold King Mine near Silverton. 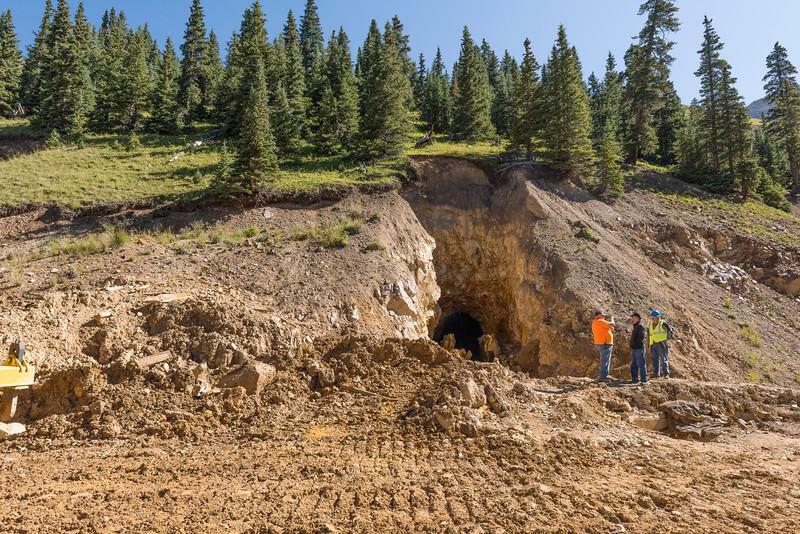 Under Lamborn’s bill, so-called “Good Samaritan” permits would provide limited liability protections for non-profit groups, local governments and the mining industry to clean up abandoned mines. Under current law, Lamborn says the most qualified parties for cleanup efforts are “scared away” by the possibility of assuming 100-percent liability for old mine sites. Re-mining is floated as a way to incentivize and help pay for cleaning up old mines, but some environmental groups balk at the idea of letting modern mining companies take on old mine messes because of the possibility of making things worse. Lauren Pagel, policy director of the nonprofit environmental group Earthworks, testified last month before the U.S. House Subcommittee on Water Resources and Environment that the mining industry cannot be allowed to call the shots with Good Samaritan cleanup legislation. “If a ‘Good Sam’ version passes that the mining industry favors, it would allow a private entity to create an Animas [River]-type spill, and exempt the polluting party from responsibility for their mistake or from compensating damaged communities downstream,” Pagel said. But Stuart Sanderson, president of the Colorado Mining Association, said Good Samaritan legislation will remove the disincentives to private-sector cleanups of abandoned mines, which include perpetual liability under the Clean Water Act and operator status under the Comprehensive Environmental Response, Compensation, and Liability Act (CERCLA) – the law overarching EPA Superfund. “Public sector and EPA cleanups will continue, but to the extent that private-sector mining companies are allowed to participate, there is no harm in allowing those companies to help defray costs through the removal of any minerals they may be able to extract,” Sanderson said. Doug Young, senior policy director of the Keystone Policy Center, a nonprofit conflict resolution organization based in Keystone, Colo., is working is help draft Good Samaritan legislation that works for everyone. He told the House Subcommittee on Water Resources and Environment he’s been working on the issue for 20 years and hopes to avoid the usual pitfalls. Earthworks’ Pagel argues the EPA already has a process called an Administrative Order of Consent that removes liability for groups truly interested in cleaning up old mines. What’s really needed, in her opinion, is reform of the antiquated 1872 Mining Law, which does not require royalties for mining hardrock minerals on public lands. Such a pool of money could be used for cleanup of the thousands of abandoned mines leaching into streams around the West. “The only way to begin to address the pollution associated with old mine sites is to create a robust Hardrock Mine Reclamation Fund – similar to the fund that was created in the 1970s for the coal mining industry,” Pagel testified. Rep. Lamborn, however, says mining reform is a non-starter in a Congress controlled by his party, primarily because it will kill mining projects and jobs. Colorado Sen. Michael Bennet last week joined New Mexico Sens. Tom Udall and Martin Heinrich, all Democrats, in introducing the Hardrock Mining and Reclamation Act of 2015, which would reform the mining act to charge royalties and create a cleanup fund. But Keystone’s Young, who worked on Good Samaritan legislation for years for Tom Udall’s cousin, former Colorado Sen. Mark Udall, says mining reform is too tough a fight in the current congressional gridlock. “If you create a program of Good Samaritan and deal with the liability, the funding will come without having to do a frontal, uphill political battle of either amending the 1872 Mining Law or proposing other fees and royalty funding provisions,” Young said, adding there are 30 watershed groups in Colorado focused primarily on abandoned mine drainage. What role does the EPA play? Lamborn does not mince words on his distaste for the EPA and how it’s failed to handle the Gold King Mine mess and drainage from other abandoned mines in the area. He blasts the agency for causing the sudden surge of 3 million gallons of acid mine drainage in August and for its failure to stop the same amount that’s been pumping into local streams every week for years. Since the spill, however, the EPA has installed at $1.5 million water treatment facility that started operating last month, and some local officials credit the agency with working on the complex mine drainage issue for years. They don’t think demonizing the EPA accomplishes anything. Colorado Attorney General Cynthia Coffman, who is still considering suing the EPA over the spill, recently told The Statesman there needs to be more independent study of the damages caused by the Gold King release. Meanwhile, local officials from Southwest Colorado were touring the state this week checking out EPA Superfund sites where abandoned mine drainage has been mitigated, trying to decide whether that’s the best option for cleaning up Gold King and other local mines. Keystone’s Young says Gold King has put a spotlight on the broader problem and brought new energy to the debate. What Young advocates is a new Good Samaritan statute under CERCLA that avoids the pitfalls of reforming the mining act, something business interests and pro-business Republicans in Congress have fought for decades, and also avoids amending the Clean Water Act, which would draw the ire of many Democrats and environmentalists. “We ought to take advantage of this opportunity to avoid those pitfalls and really look at a new approach.” Young said.